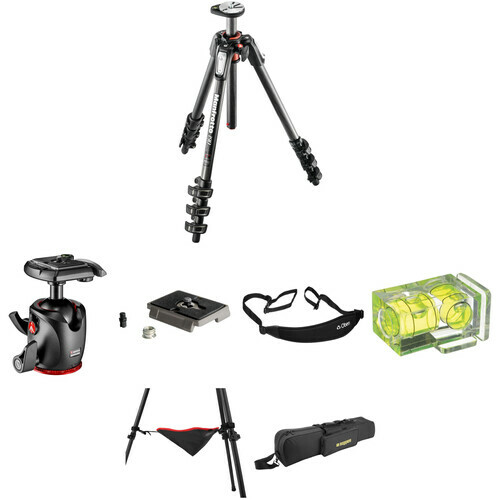 This Deluxe B&H Kit pairs the Manfrotto MT190CXPRO4 Carbon Fiber Tripod with a MHXPRO-BHQ2 XPRO Ball Head. Also included in the kit are a tripod strap, an extra QR plate, a tripod case, bubble level, and a stone bag. These accessories will both help protect your tripod, and make it easier to capture quality images. Holding up to 15.4 lb of gear, and with a maximum height of 67.5", the tripod features a Quick Power Lock System that allows you to completely extend the tripod legs with just one hand. Once set up you can use the MT190CXPRO4's rapid center column in standard vertical mode or swing it into horizontal position like a boom with Manfrotto's 90° column feature. Enlarged tabs on the individual leg angle selectors allow you to get down low for macro work with the column in horizontal mode. And once you're down there you can attach any of Manfrotto's flexible or articulated arms to hold lights or reflectors via the Easy Link plug built into the tripod's spider. The included MHXPRO-BHQ2 XPRO Ball Head with 200PL Quick-Release System is strong enough for most applications and ideally suited for the MT190CXPRO4. The XPRO head lets you fine-tune your adjustments, thanks to separate knobs for both the ball and the 360° panning as well as a friction control knob for more exacting placement. The 200PL quick-release clamp and plate allow for quick camera attachment and removal, and two bubble levels let you adjust your camera so the horizon is level. A numbered scale around the base of the head makes repeating exact pans an easy task. This kit also provides an extra quick-release plate. To carry the tripod when it's not in the case, a strap with a neoprene shoulder pad is provided. Also included is a stone bag that attaches to the tripod's legs, providing added stability by placing stones or other heavy objects in it. The included bubble level allows you to accurately align your camera to the horizon. The black, redesigned MT190CXPRO4 Carbon Fiber Tripod from Manfrotto builds on the success and popularity of the previous 190 series with professional hardware and convenience features that make it even easier to use than its predecessor. When the three leg sections and center column are fully extended, the tripod reaches a maximum height of 63", and its load capacity of 15.4 lb makes it a good choice for larger cameras. The tripod weighs 3.6 lb, and folds down to 20.6" for transport. Set up is faster than ever with Manfrotto's Quick Power Lock System that allows you to completely extend the tripod legs with just one hand. Once set up you can use the MT190CXPRO4's rapid center column in standard vertical mode or swing it into horizontal position like a boom with Manfrotto's 90° Column feature. Enlarged tabs on the individual leg angle selectors allow you to get down to only 3.2" for macro work with the column in horizontal mode. And once you're down there you can attach any of Manfrotto's flexible or articulated arms to hold lights or reflectors via the Easy Link plug built into the tripod's spider. Convenience features include a bubble level that rotates so that you can see it easily regardless of the tripod's position. Finally, Manfrotto's insistence on form following function has yielded a tripod that you'll not only be happy to use but you'll be happy to be seen with, too. The Quick Power Lock (QPL) system is one of the most eye-catching and unique features of the redesigned 190. It is a strong, ultra fast, ergonomic locking system that allows for complete extension of the legs with one hand. One of the most innovative aspects of the 190 series is its compactness, which allows for easier portability. The redesigned patented 90° Column is accessible whenever you need it with simple one finger operation. The plug allows instant connection between tripod and accessories, such as LED lights for macro photography and DSLR video applications using Manfrotto articulated arms and brackets. The bubble is easy to read, whatever the shape of the head or however the tripod is positioned. Just rotate it towards you for easy viewing. Each leg has user selection of four angles to accommodate uneven ground or rough terrain. The selectors are manufactured according to most innovative ergonomic standards to prevent fingers and nails being trapped in the upper casting. The entire shape of the tripod has been modified and made more manageable and stylish. The complete redesign of its functional elements shows a particular attention to aesthetics and details: the brand name, for example, appears in many sections of the new 190, including the two legwarmers made of comfortable rubber to provide a secure grip and prevent the conduction of heat and cold in extreme weather conditions. This XPRO Magnesium Ball Head from Manfrotto features an integrated RC2 quick release cam lock and a 200PL-14 Quick Release Plate. RC2 compatible quick release plates such as the 200PL-14 can be removed from the head by pulling the cam lock's spring-loaded lever, which also allows the plate to be instantly reattached. The cam lock also features a safety catch to prevent the 200PL-14, or another compatible quick release plate from accidentally disconnecting. The XPRO Magnesium Ball Head with 200PL-14 Quick Release Plate has a load capacity of 22.1 lb and can be attached to tripods or other support systems that feature a 3/8"-16 mount. By loosening this XPRO Magnesium Ball Head's primary locking knob, its ball-and-socket joint can be quickly swiveled, angled, fully tilted, or returned to its upright position. Toward the ball head's base is a secondary locking knob that controls the ability to rotate the head 360°. An additional knob opposite the secondary locking knob can be rotated to apply tension control to the ball-and-socket joint's movements. Cameras or accessories that are compatible with a 1/4"-20 mount can be connected to the 200PL-14 quick release plate which measures 1.7 x 2.1 x 0.4" and has a rubberized, non-slip surface. The Manfrotto 200PL Quick Release Plate with 1/4"-20 Screw and 3/8" Bushing Adapter is the replacement quick release plate for all heads that use the RC2 (3157N) system. The plate comes with a 1/4"-20 camera screw and a 3/8" bushing adapter, and is compatible with 35mm and standard thread-mounted medium format cameras. The black TS-200 Tripod Strap with Two Quick Release Loops from Oben features two quick release loops-one each at the top and bottom to hold your tripod's legs and head. The solid 1" wide nylon strap is complemented by a 3" wide, non-slip and comfortable 9.5mm thick neoprene shoulder pad that evenly distributes the weight of your tripod. Once adjusted, the strap length back buckles to hold it at your preferred length. The leg loop adjusts to a maximum of 19" wide while the head loop is secured by a 14" maximum wide loop. The plastic quick release buckles at each end of the strap allow for fast attachment or use of your tripod. When the shot is there, you don't want to waste time fumbling with overly sophisticated attachment systems. This is a cost-effective tripod strap that fits many tripods and gives you the freedom to travel, set up and pack with speed and efficiency. The strap is backed by a one-year limited warranty from Oben. Fully adjustable, back buckled strap - approx 20-44.5"
This Two-Axis Hot Shoe Bubble Level from Vello mounts onto any standard hot shoe on a camera. It allows you to precisely align the camera on two planes, to ensure that the horizon line is absolutely straight. This is a necessary accessory for QTVR shooting sessions, for landscapes, or any other photography requiring fidelity to a horizon line or other straight-line elements. This Tripod Hammock from Oben attaches to your tripod's legs via hook-and-loop fasteners. It holds up to 20 lb, lowering the center of gravity and adding stability when using a heavy camera and lens, or when shooting in windy conditions. It can also be used as a shelf to store accessories that you need quick access to like lens caps, filters, or lenses. Store, transport, and protect an up to 35" tripod, stand, softbox, or other gear with the black Deluxe Padded 35" Tripod Case from Ruggard. This case features weather-resistant nylon construction with raised rubber feet, dual zippers for easy access to gear, and equipment straps. Accessories are stored in an interior pocket or in the 13" exterior zippered pocket. The soft interior fabric is gentle on equipment, and colored gray for improved visibility in low light. Carry your Deluxe Padded Tripod Case with the dual touch-fastening top handles, or wear with the removable, adjustable, padded shoulder sling strap. Photographers will appreciate the handy identification window and versatile design. The bag fits a tripod or light stand that folds down to 35". It has a tapered shape to accommodate video tripods with heads attached, and is also convenient for transporting items like umbrellas, boompoles, monopods, and sliders to your location. The dual-zippered opening helps provide quick access to the contents, while the large sliders are easy to grab and offer smooth action. Interior straps for securing equipment. Sturdy dual carry handles are integrated into the bag to support the heaviest loads, and they have a touch-fastener wrap that puts comfort in your hands. A removable shoulder sling affords a convenient option in case your hands are full with other equipment. The bag's exterior is made from lightweight and durable weather-resistant nylon fabric. Inside the bag, your gear is surrounded by a soft nylon fabric lining that won't scratch the finish of your equipment. An external 13-inch accessory pocket is perfect for storing extra quick release plates, remotes, or cables. This pocket comes with a removable divider so you can organize your additional tools. And inside is a touch-fastener compartment for other lighting accessories you need for your shoot. The lightweight and thin profile is designed to carry your bulky tripods with ease. You can also use the bag for transporting items that you need to hand-carry to your shoot, such as umbrellas, collapsible softboxes, or boompoles. This bag has an identification window on the side for your contact information, or for writing down what equipment is inside when used alongside other Ruggard bags. Raised rubber feet on the bottom help in elevating the bag and minimizing any contact with dirt or moisture, as well as preventing undue wear and tear on the bottom of the bag. Box Dimensions (LxWxH) 21.9 x 5.4 x 5.4"
Box Dimensions (LxWxH) 5.3 x 4.9 x 3.5"
Box Dimensions (LxWxH) 2.6 x 2.0 x 0.5"
Box Dimensions (LxWxH) 18.5 x 4.3 x 0.7"
Box Dimensions (LxWxH) 2.0 x 1.6 x 0.1"
Box Dimensions (LxWxH) 9.5 x 6.0 x 0.2"
Box Dimensions (LxWxH) 36.0 x 10.5 x 2.0"